Somerville Mayor Joseph Curtatone initiated this project in 2006 when he approached MAPC with the idea to bring the cities of the Chelsea, Everett, Malden, Medford and Somerville together to work on Mystic River issues. Mayor Curatone secured partial funding for the project with a contribution from the Massachusetts Water Resources Authority (MWRA). MAPC supplemented the MWRA’s contribution with funding received under the District Local Technical Assistance Program. This project is a collaborative effort between MAPC, Boston Redevelopment Authority (BRA) and the Cities of Chelsea, Everett, Malden, Medford and Somerville. MAPC is helping these communities develop a targeted strategy for realizing the full potential of the Mystic River, and working to raise community awareness on the project. This project helps to fulfill the MetroFuture goals of creating healthy environments and increasing community vitality. The health of the Mystic River will be a major contributor to the economic vitality and quality of life for the cities that it passes through. Our vision is for the waterfront to serve as a vibrant area where residents live, work and play. Some of the ways that this vision will be achieved include improving access to open space along the river, and connecting those spaces with a trail network that makes the river easily accessible by foot, bike, transit and water shuttles. A video created by the Environmental Protection Agency (EPA) about the Mystic River Watershed Initiative. The EPA brochure for the plan. Department of Conservation and Recreation’s Mystic River Master plan. The Lower Mystic River Corridor Strategy seeks to integrate environmental justice into all of the strategy elements. This list catalogs plans, reports and studies that are currently available in electronic formats. There are many other reports that are available only in hard copy. We will add reports as whenever we receive them. 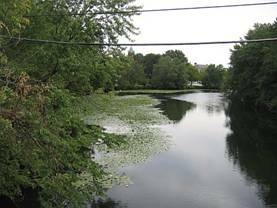 Prepared for the MA EOEA and DEP, this plan provides an overview of conditions in the Mystic River Watershed and presents an action plan for protecting and restoring its urban and natural resources. Recommends the primary focus should be on taking specific action to improve water quality, reduce flooding and low flow problems, and enhance land uses along the waterfront to support recreation and habitat. Prepared by Tufts Urban and Environmental Policy graduate students, this report identifies case studies of waterfront redevelopment projects and best management practices for the MyRWA. The plan recommends strategies such as municipal and stakeholder collaboration, master planning, public outreach, environmental remediation, and public access. Prepared by the City of Boston Parks and Recreation Department, this open space plan analyzes open space lands and facilities, assesses future needs, and presents an action plan. The plan for Charlestown identifies numerous opportunities related to the Mystic waterfront, such as revitalization of Little Mystic park, boardwalks to improve access to the waterfront, maintaining public visual access to the waterfront, and supporting guidelines in City’s Municipal Harbor Plan. The East Boston plan identifies opportunities for a continuous harborwalk and enhancing the natural resources along the waterfront. The Boston Redevelopment Authority (BRA) has developed the East Boston Municipal Harbor Plan for submittal to the Secretary of Environmental Affairs in accordance with 301 CMR 23.00, et seq., Review and Approval of Municipal Harbor Plans. The purpose of the plan is to create a comprehensive framework to guide the development of East Boston’s Inner Harbor waterfront in a manner that reflects the city’s and community’s vision for the area and conforms to the objectives of the state’s Waterways Regulations. The East Boston Municipal Harbor Plan (EBMHP) will provide guidance to the community, developers and to the Department of Environmental Protection (DEP) Chapter 91 licensing process. It is intended to be a planning tool for the near to mid-term future that will be updated to reflect conditions at the end of the ten-year timeframe being requested for this plan. Prepared for the cities of Chelsea and Revere, this study examines the development potential at key properties/districts along the Chelsea and Mill creeks. The 2007 plan described above updates the findings and recommendations of this report. This plan reviews the progress since the Open Space Plan of 1994 and identifies actions to direct open space improvements for the next five years. Some of the goals stated in the plan include providing recreational opportunities and taking advantage of the city’s environmental, historic, and scenic resources. The City is currently in the process of updating its’ plan. Prepared for the City of Everett, this assessment evaluates the existing land and waterside conditions along the Everett waterfront (Malden River, Mystic River, and Island End River). The study identifies potential opportunities to create public access to and from the water and to protect and enhance existing marine industrial uses. Provides very detailed land use analyses, future opportunities and concept plans, and action items. There are no reports currently available in electronic versions. Prepared by MIT students, this study looks at strategic areas in Medford Square and along the Mystic River and provides recommendations for revitalization. The goals include better connections to the river, vibrant mix of uses along the river, engaging the public, and restore/maintain ecological resources. The study recommends collaborating with DCR on Mystic River Master Planning, form a Medford Greenway Committee, and develop public-private partnerships. This plan provides an overview of Somerville’s history, physical development, and environmental characteristics. It also provides an analysis and needs assessment that leads to a five-year action plan. Open space goals include preserving, enhancing, increasing the number of open spaces, and improving environmental conditions. Land Resource Planner, Joan Blaustein, and Legal Counsel, Jennifer Garcia, represented MAPC at the Second Annual Mystic River Festival sponsored by La Comunidad, Inc. on Saturday, August 7, 2010, at the Village Landing Park in Everett. The festival’s purpose was to raise public awareness about the environmental degradation of the Mystic River and what can be done to improve the river. A bi-lingual one-page handout about MAPC’s work on the Mystic River (in English and Spanish) is available here for download.